Digging Deeper into Forensics has been designed as a direct result of requests from people who have previously attended our CSI Experience. It is designed to cover topics we didn’t have time to cover and to give a more in depth view of some of the things we barely touched on earlier. Don’t worry though if you haven’t attended the CSI Experience previous attendance is not necessary as there in no requirement for prior knowledge. 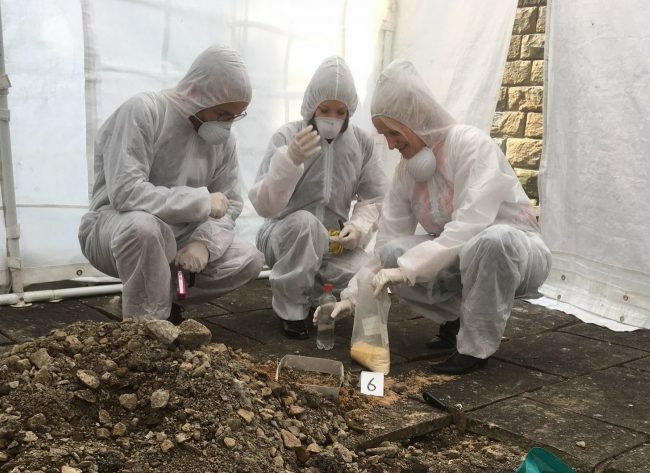 Similar to the CSI Experience, Digging Deeper into Forensics is a three-hour session exploring the evidence behind a high-profile famous crime. Please click on the date to book. If you are buying Digging Deeper into Forensics as a gift please let us know and we will personalise a voucher for you with the recipients details and a message of your choice. This is an event for adults however we welcome people over the age of 14 years provided they are mature enough to cope with content which is based around true crimes and our experiences in the field. Digging deeper into forensics is hands-on; you’ll be using actual forensic equipment and following forensic techniques used in the field. What will be most evident is how far from reality those CSI shows are! Described as ‘one of the best days out you’re able to have’, our experience days become booked up quickly. Our family CSI days are perfect for both kids and adults; families enjoy learning together and developing new skills, and communication is paramount. Morning or afternoon sessions are available. Join us for a few hours of exploration into the world of forensic science and crime scene investigation. This really was one of the best day out I’ve had in years!